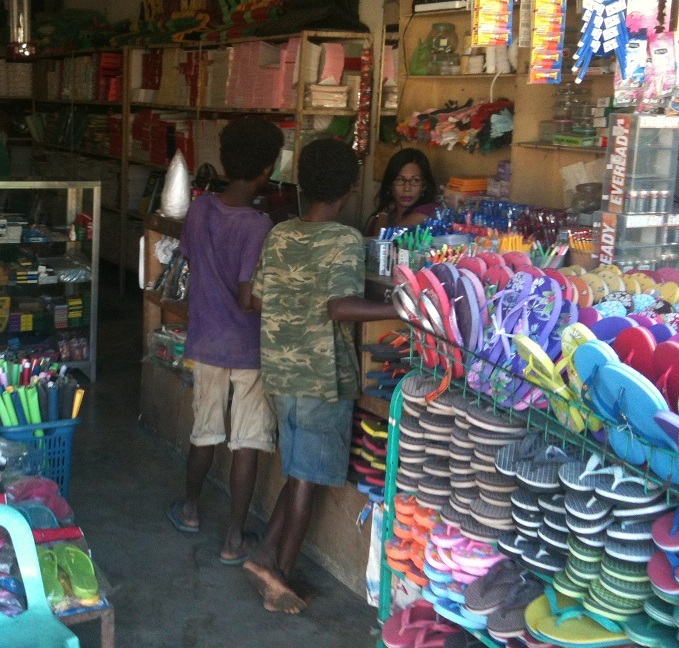 After two months in Papua New Guinea, I was ready for my first break and my first destination was the Philippines. 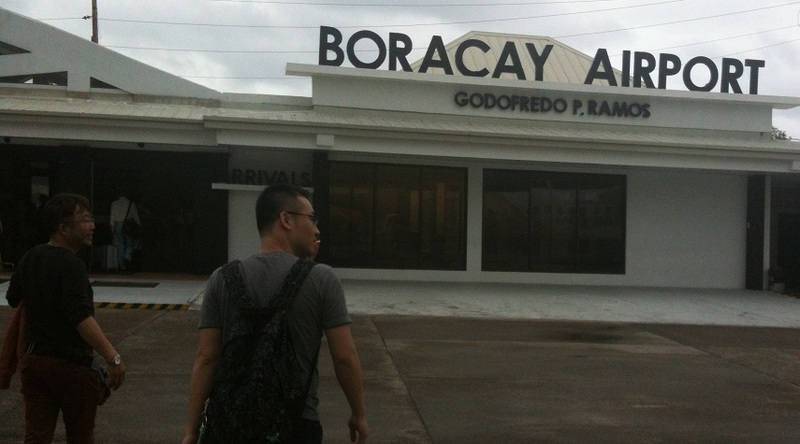 I arrived in Manila and the next morning I caught a flight to the resort island of Boracay. The plane was a turboprop ATR72-500 (much like a Dash-8). It’s a comfortable enough aircraft but a tad loud near the engines. The flight had its share of amusement value. There was no safety demonstration so I have no idea where my life jacket was or if it even had a light and a whistle to attract attention. In a pinch I guess I could have looked under my seat. Maybe it was there. But instead of the safety demonstration, about 20 minutes into the flight they played a game where the first person to produce a 500 Peso note won a prize. 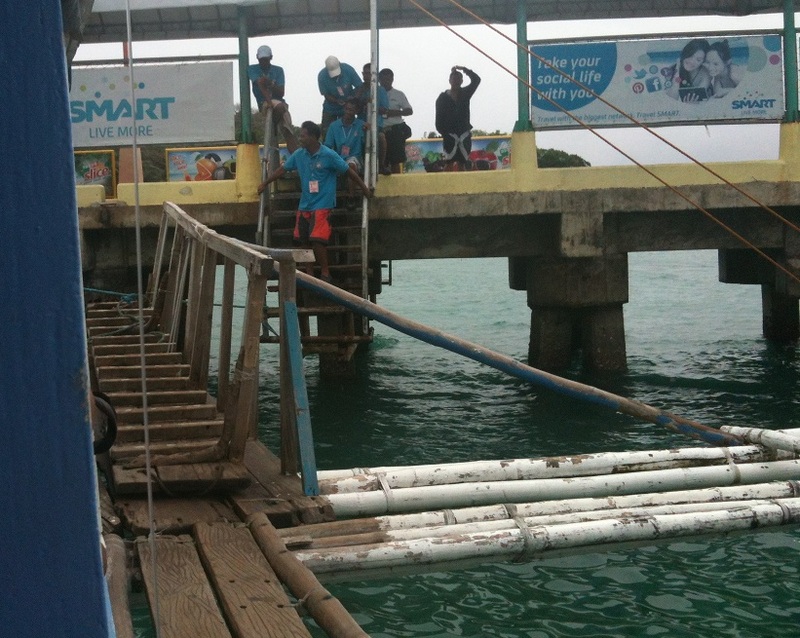 The island does not have an airport so one has to fly to Caticlan and then transfer to the port for a two kilometre boat ride to Boracay. 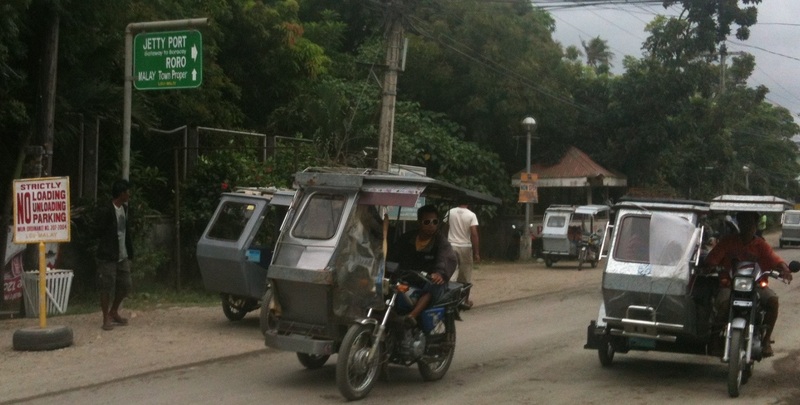 There is a bustling trade in sidecar rides from the airport to the boat terminal. I bucked the system and walked, which took all of five minutes. It was an interesting walk through the local village. 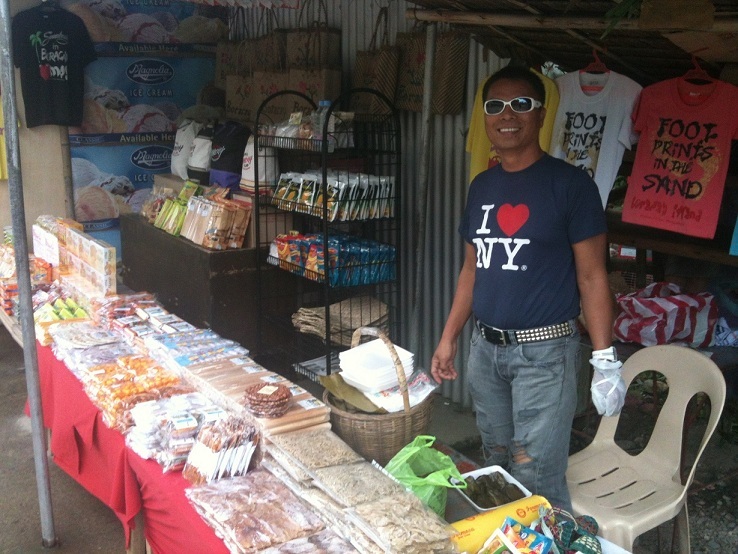 I bought a bunch of bananas for 15 pesos (40 cents). 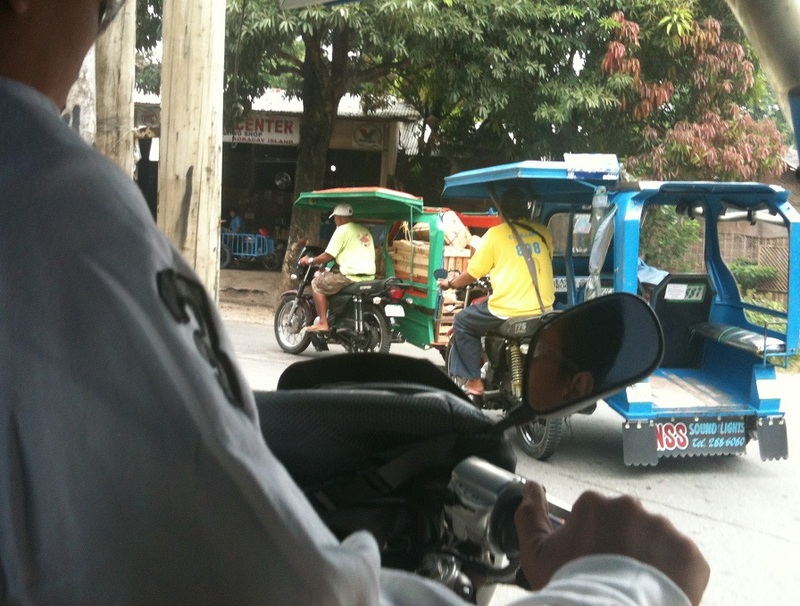 As I walked, I was treated to the horrified stares of the sidecar drivers who were devastated to see a foreign tourist walking to the port. There were hundreds of other tourists partaking of their services so I’m not sure that one fewer will really hurt them. 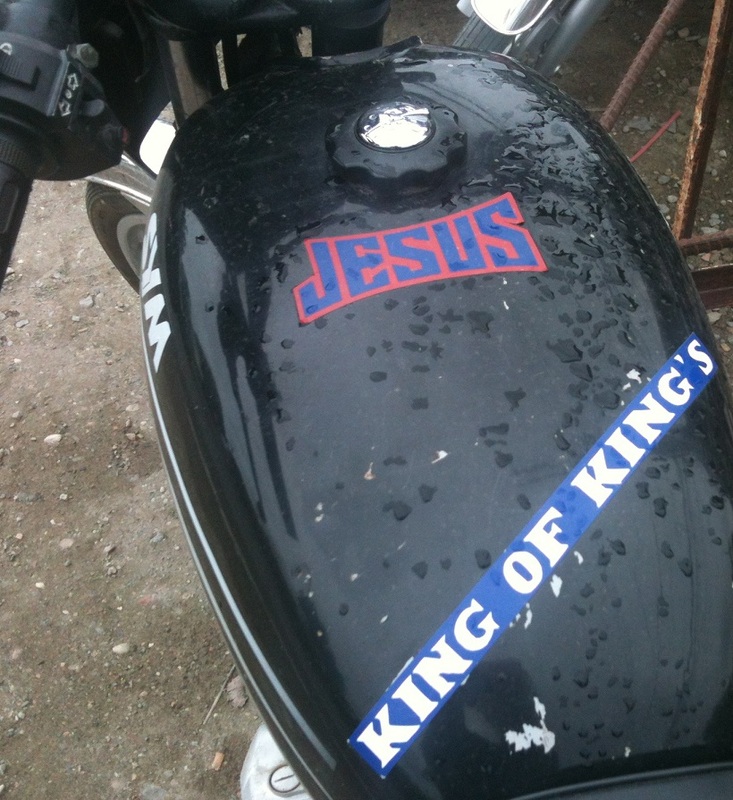 I passed a parked motorcycle plastered with religious slogans. Everyone knows that superfluous apostrophes make Jesus sad. If you’re going to try to convert me with your motorcycle decorations at least get the grammar correct. 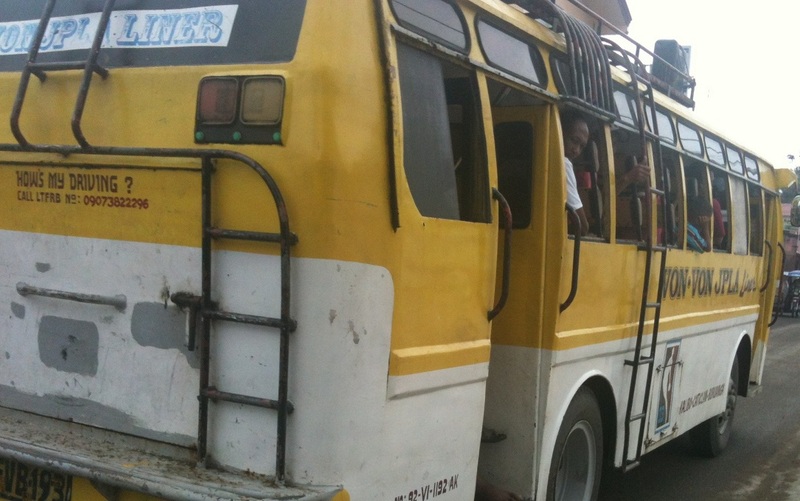 I arrived at the boat terminal and subjected myself to the ordeal of boarding, “Yes sir, I know you have three tickets but you also need a port terminal fee ticket – 100 pesos”. I zigzagged along the circuitous (and completely unmarked) path through the terminal. The sight of the boats made me catch my breath. Not in a good way. That seemed like an awful lot of sea to cross in such a flimsy looking vessel. I figured I have survived so much only to die on a sinking Tri Catamaran decorated like a Christmas tree. 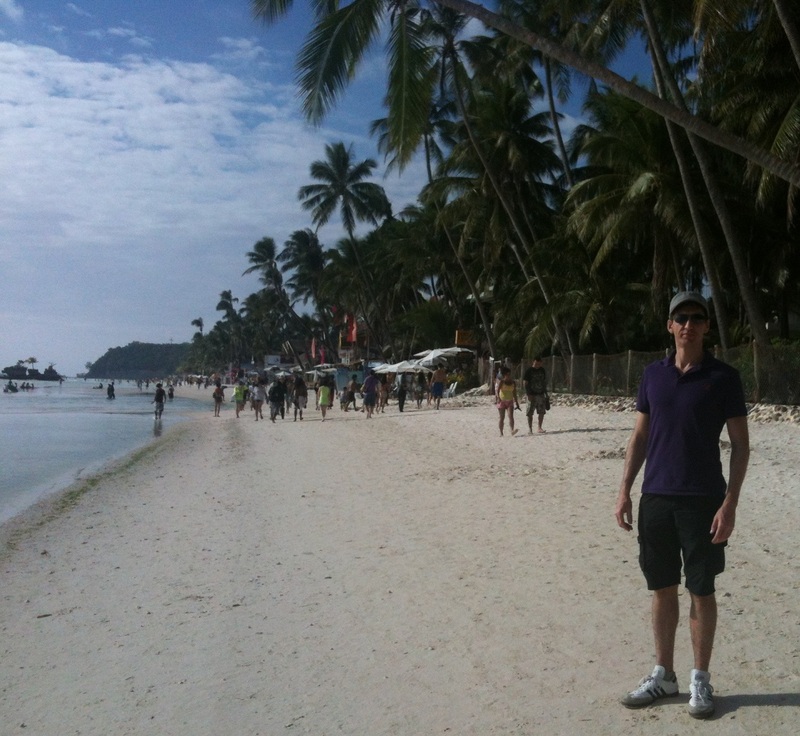 Despite my fears, we arrived safely on Boracay and I began walking towards the tourist area. A friendly South Korean couple took pity on me and stopped to invite me to join them on their sidecar motorcycle. The poor machine was spluttering and barely able to keep moving with the weight of four adults loaded on to it. I paid my share – 40 cents – and splurged to pay for the Koreans as well. They live in daily fear of nuclear disaster at the hands of the irrational dictator to the North. I figured I’d help them out with a cab fare at least. Can’t do much about the dictator. 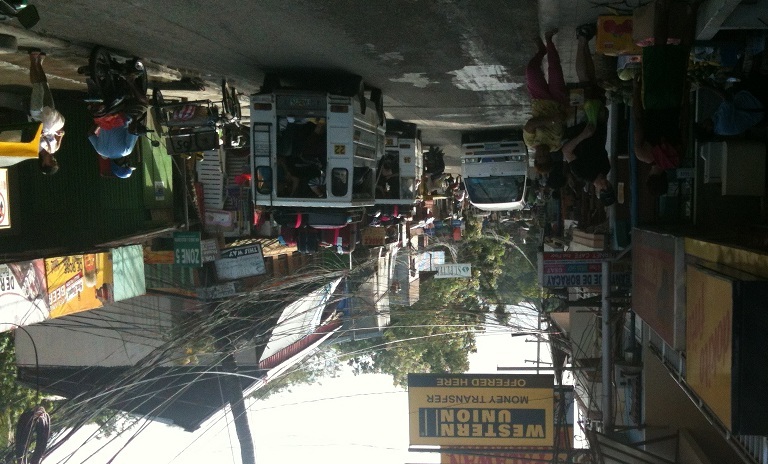 The main arterial road through Boracay is absolute bedlam. 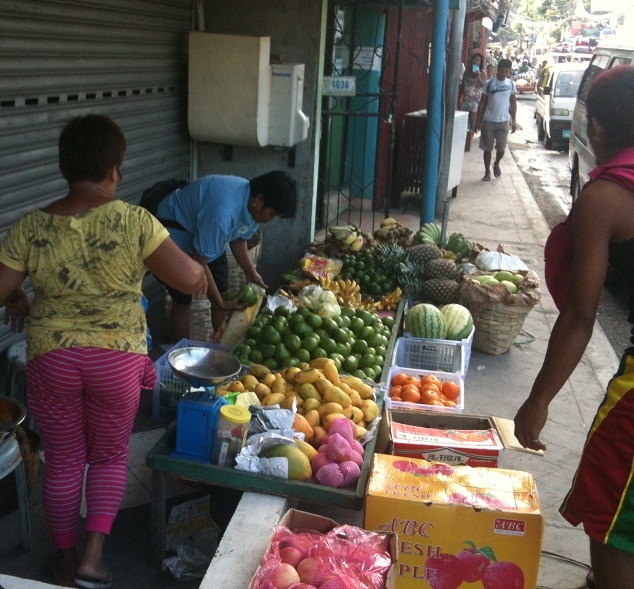 Each side of the narrow road is filled with small shops selling all manner of cheap goods. There are some similarities to PNG, but one notices all kinds of differences immediately. 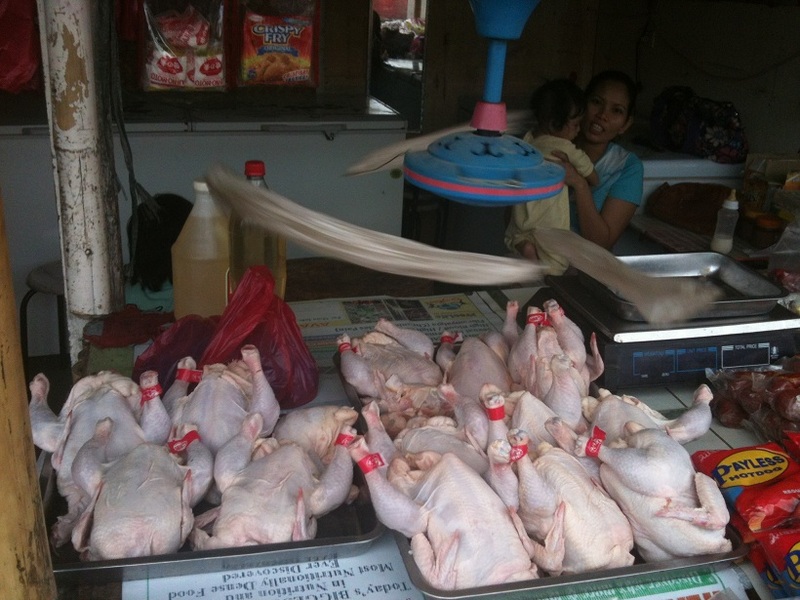 This store was selling chickens out in the heat of the day. Forgot your flip flops / thongs? No problem; I know just the place to pick up a new pair. 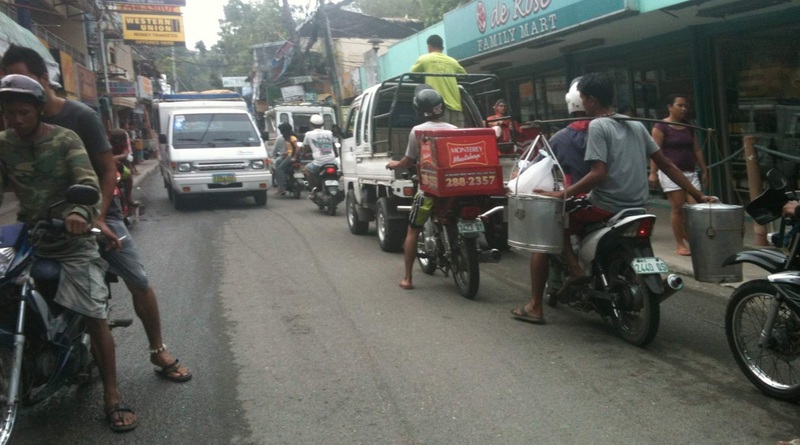 One has to be quite careful when walking along the street because the traffic is chaotic and the drivers whiz past allowing almost no margin for error. 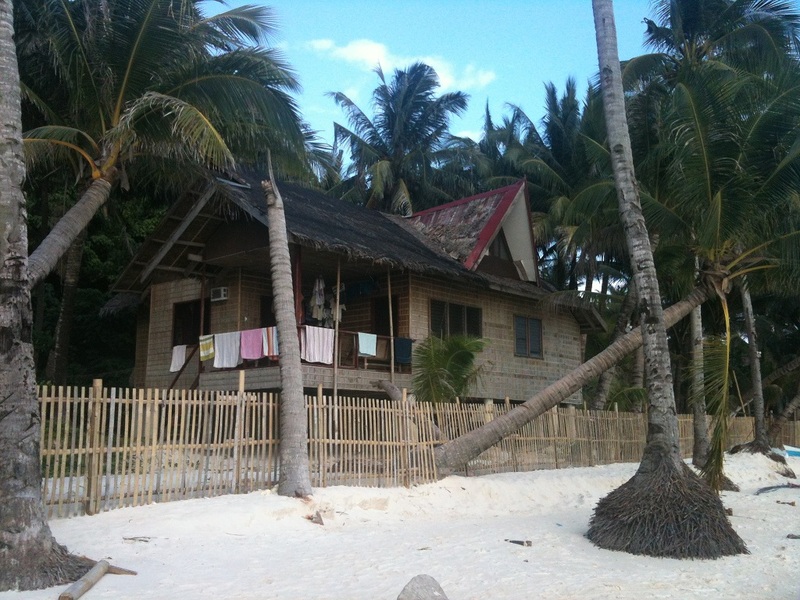 Many of the buildings are constructed from locally-sourced materials and have thatched roofs. 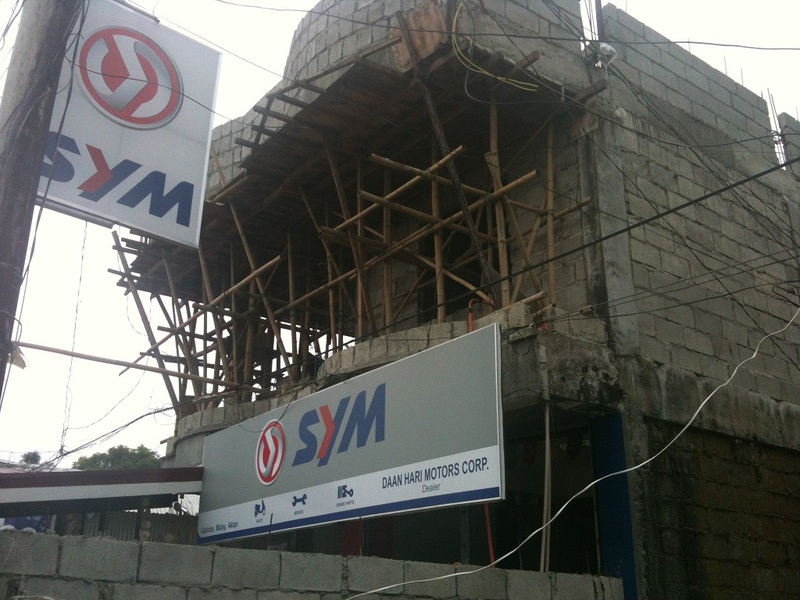 One sees the use of bamboo in creative ways – including as a form of temporary support or scaffolding. 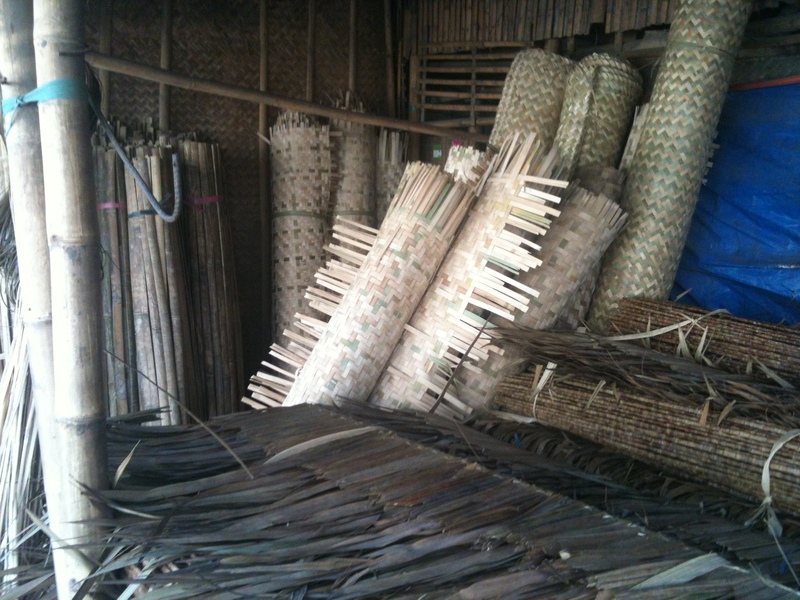 Woven panels of leaves are used for the walls. I did find the hotel and checked in with the usual hotel fuss. They asked me for identification so I gave them my PNG license with the photo of me looking like an imbecile. They accepted it and photocopied it. The copy turned out to be solid black except for my surprised facial expression. The writing was completely illegible. The staff seemed satisfied with the copy and completed my check-in. 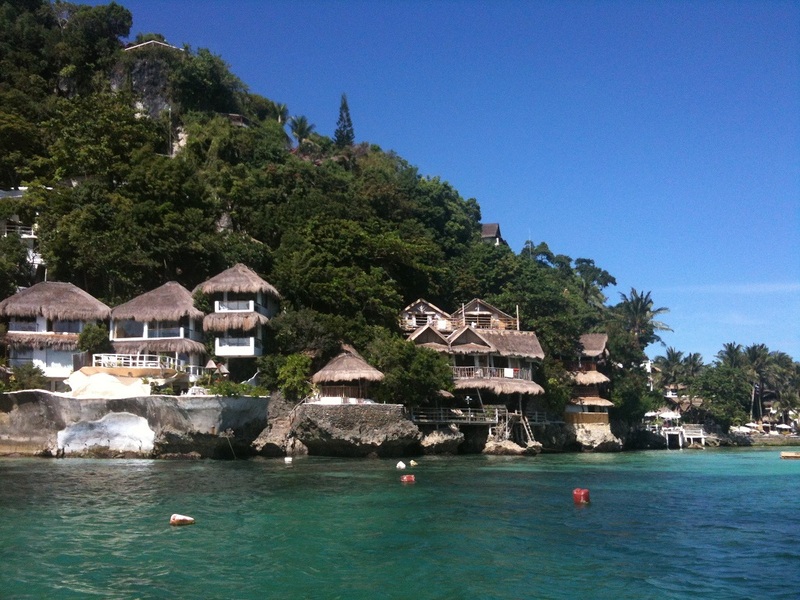 The hotel is right on the beach and so I went down for a look and instantly realised why people go to all of this trouble to visit Boracay. The beach is impressive indeed. Clear blue water and fine white sand for kilometres in either direction. 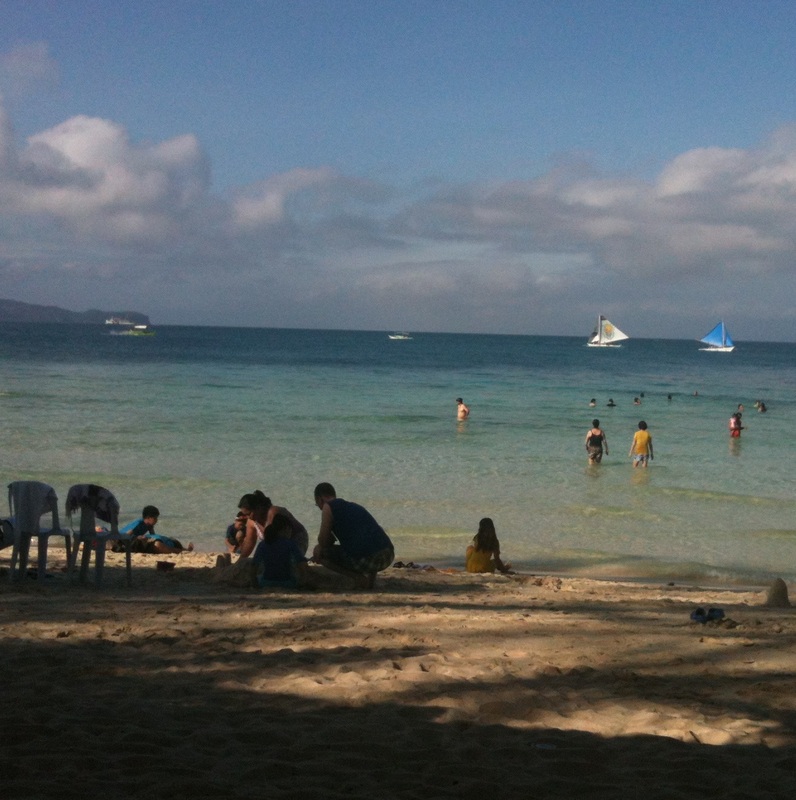 In the afternoon, I walked all the way from one end of the beach to the other – the more expensive end. 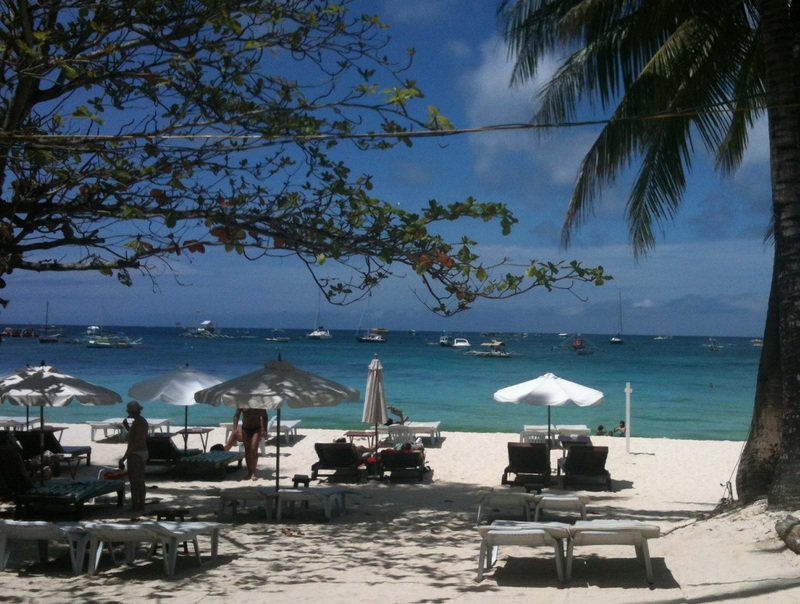 The sand there is incredible; the finest white sand that I have ever seen – almost like talcum powder. It is clean too, as is the water. They obviously understand the importance of cleaning up to people’s enjoyment of the place and therefore their livlihoods. 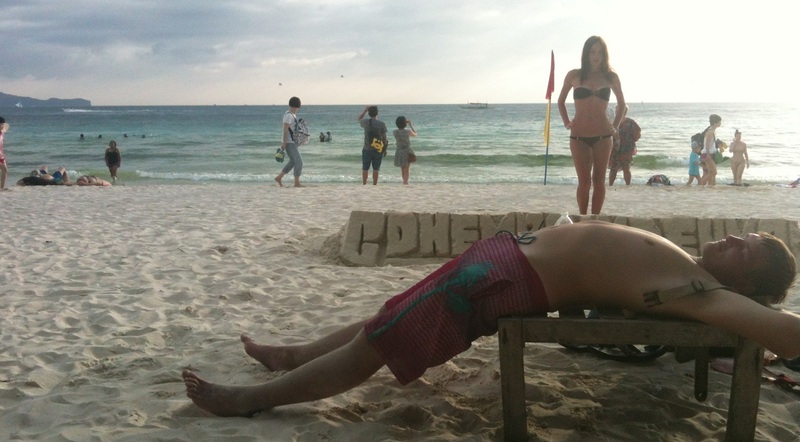 Unlike at the beach resorts that I visited in Italy last year. I was amazed by the energy of the place. There are people everywhere and from everywhere. There are Russians, Germans, Chinese and of course the usual crowd of boisterous Australians. This Russian couple asked me to take a photo for them. The chap in the foreground was celebrating his birthday so he had paid some local kids to write “Happy Birthday” in Russian in the sand. 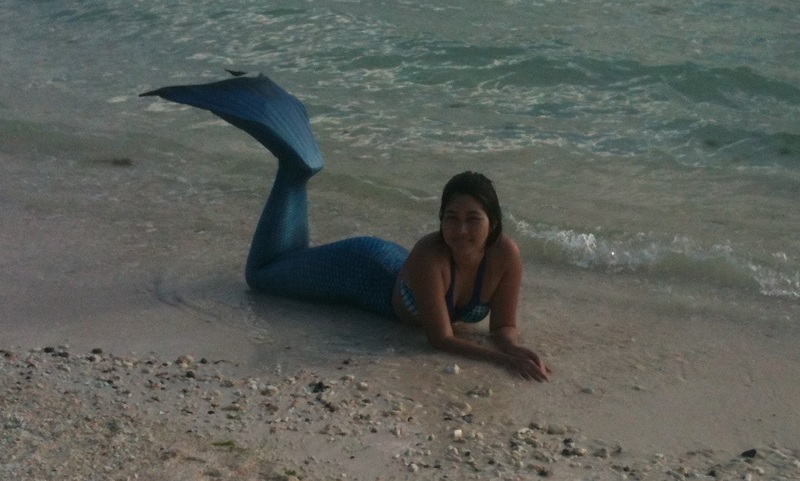 I never believed in mermaids until I came across this one washed up on the beach. 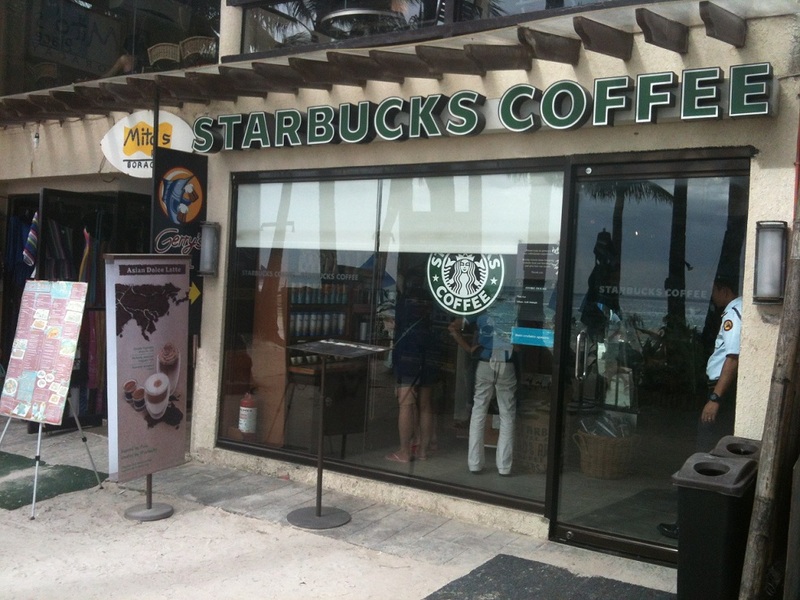 I was delighted to stumble upon a “Starbucks” as they don’t exist in PNG. I was forced to have a Frappucino. It is right on the beach and this is the view from the upstairs balcony of Starbucks. 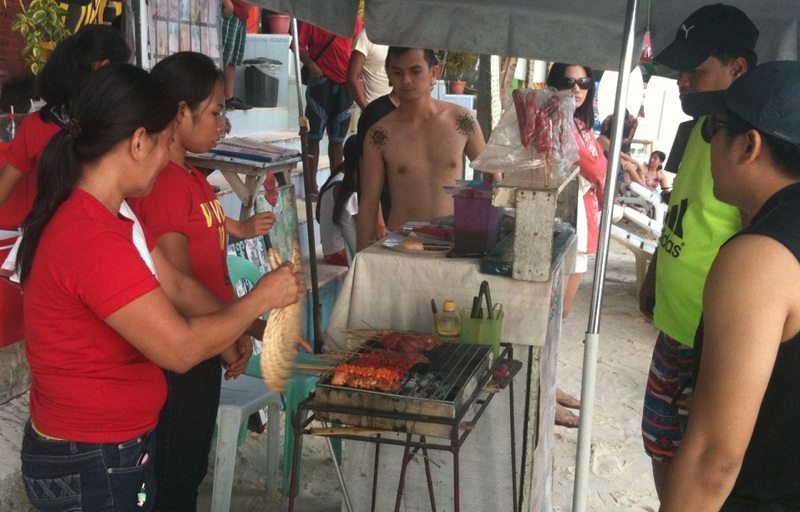 There are hundreds of restaurants and stalls selling food all along the beach. 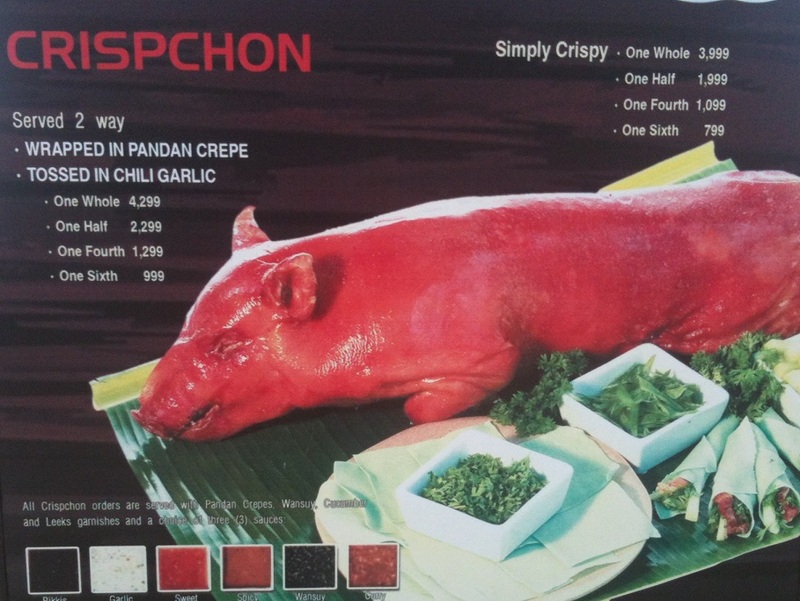 One restaurant was offering a whole pig for a mere 4,000 Pesos ($100). 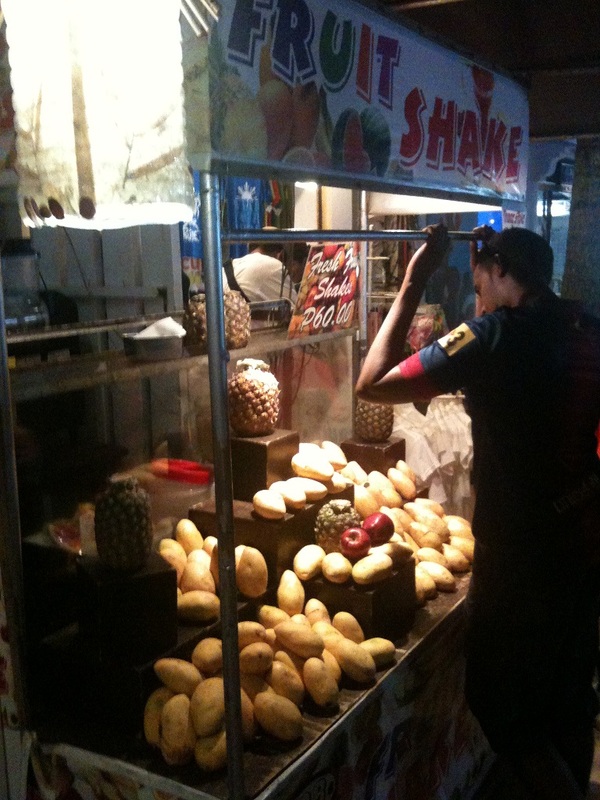 I enjoyed these stands that sell fruit smoothies for $1.50 that are made of real fruit. Hey McDonald’s are you paying attention? 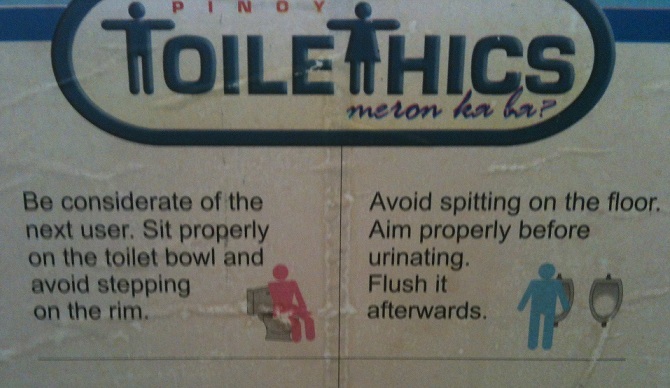 The wash rooms at one restaurant had this interesting guide to Filipino toilet ethics. This is all good advice. When I grow up, I’d like to live in this house. 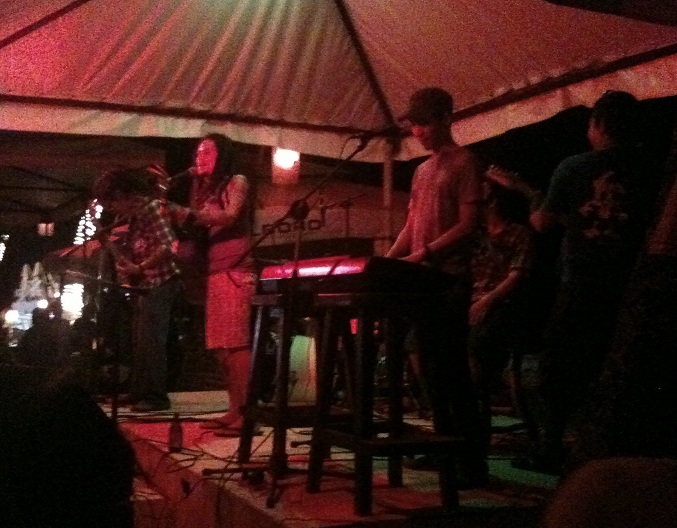 I was very impressed to find that Boracay has a thriving live music scene. 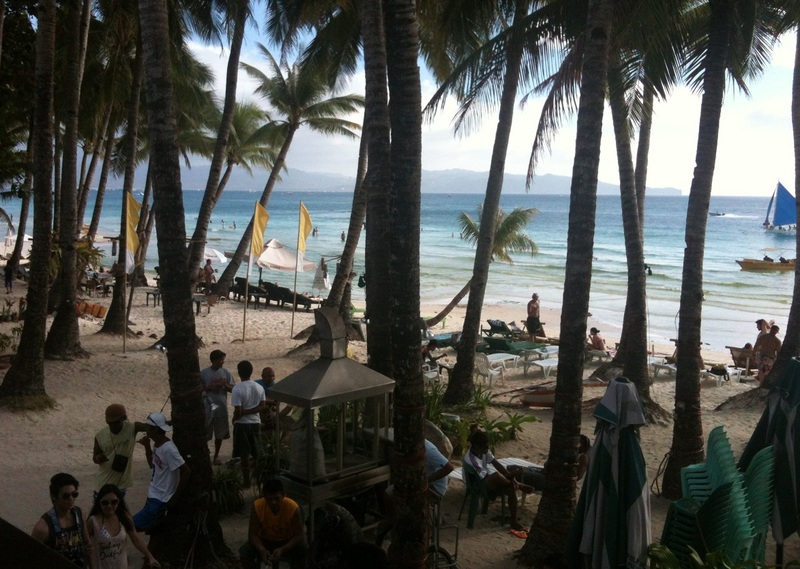 Every second bar or café along the beach has a live band playing. These guys were a very talented reggae band. The singer here is apparently a successful local musician. 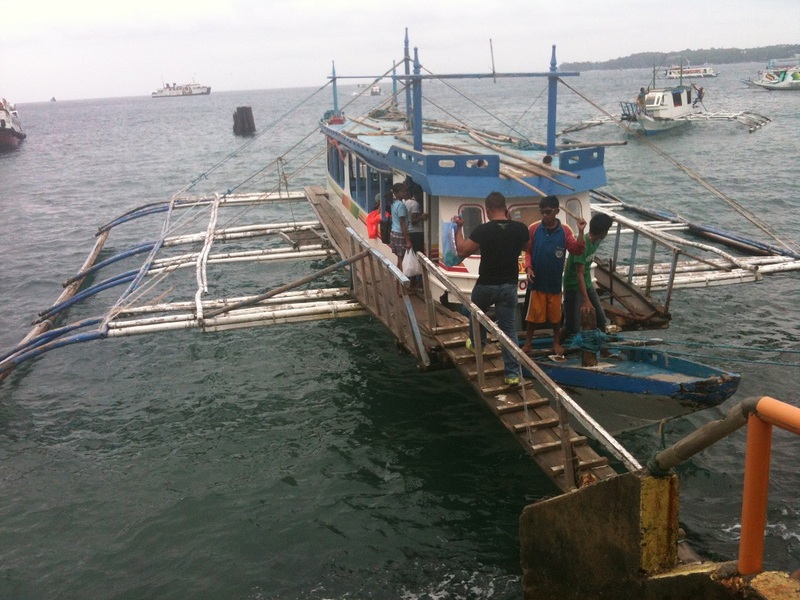 The next day, I hired a boat and a three-person crew for 2500 pesos. $63 for three hours of sailing. 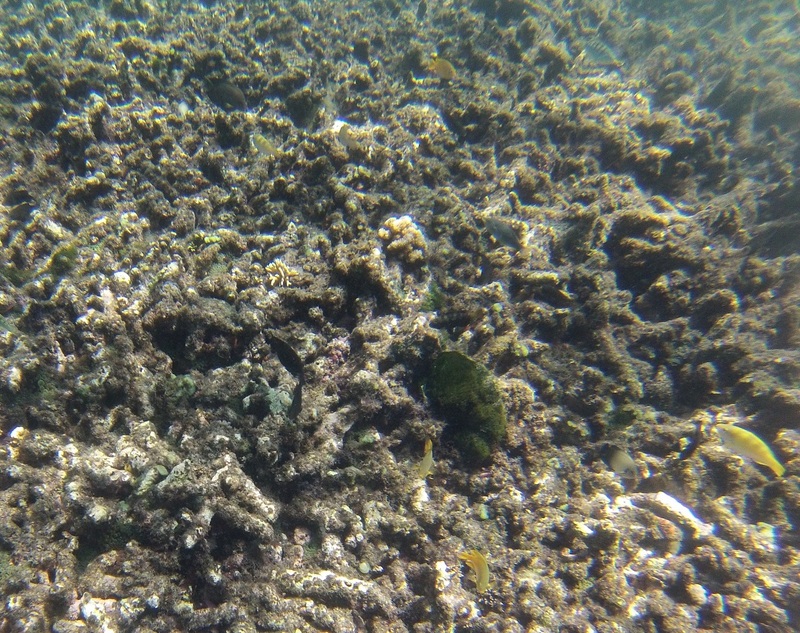 We cruised around the bay and went out to a spot where I could go snorkelling. 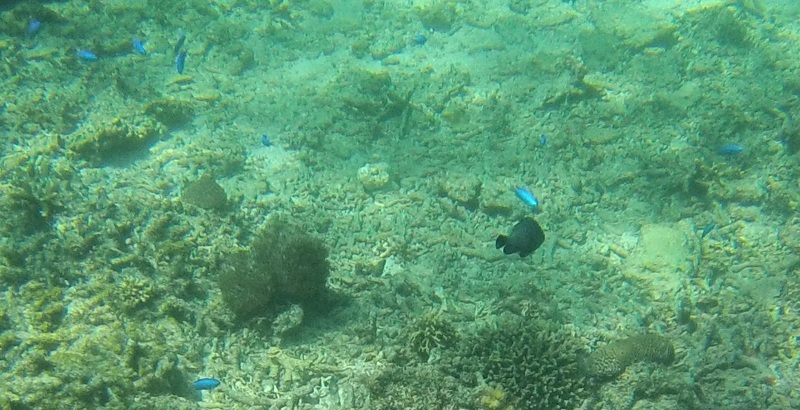 Such colourful fish and interesting coral. It was absolutely fascinating. 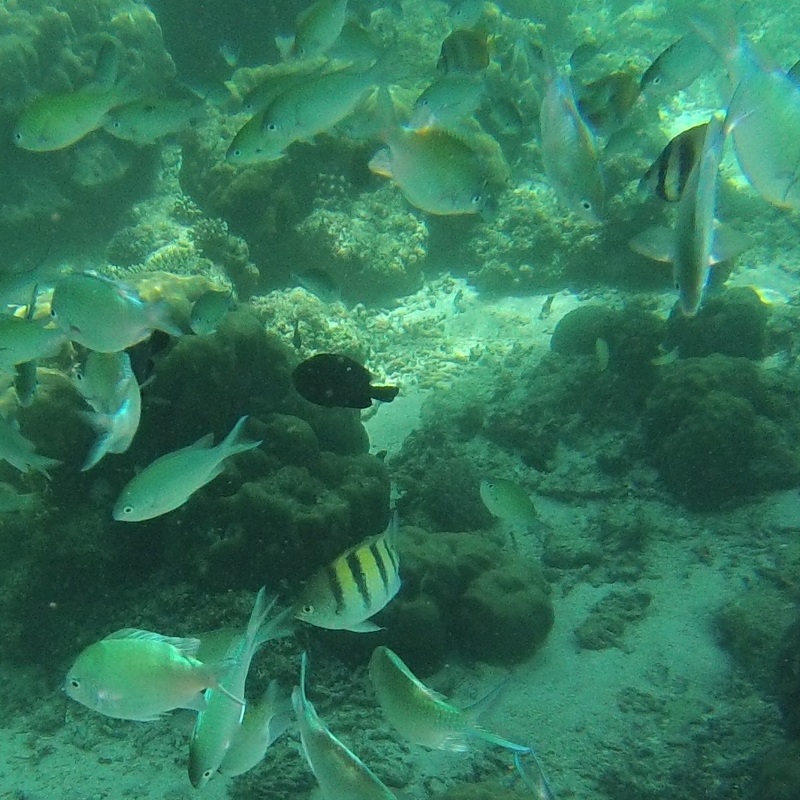 I took the opportunity to test out my new waterproof camera. 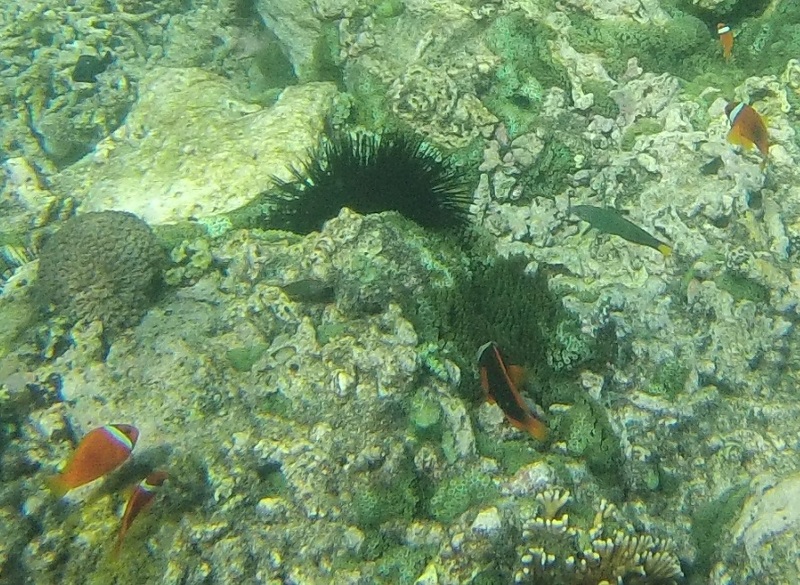 There were clown fish and iridescent blue fish plus hundreds of other tropical fish. My tour guide’s name was Japi. He was a very personable fellow and he pointed out the features of the places that we visited. 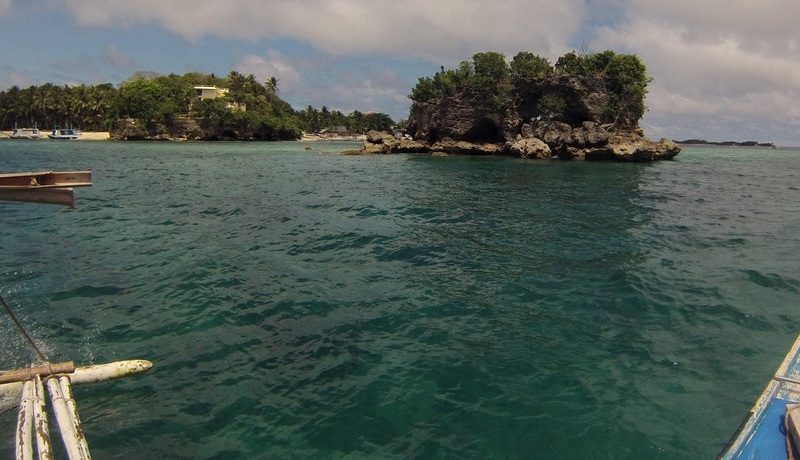 He took me right along the white beach to a secluded area on the other end of the island, called Puka beach. It has lovely sand made completely out of shells crushed into a powder. As the boat powered through the waves on the way back, I stood on the prow with the wind whipping around me, just taking it all in. 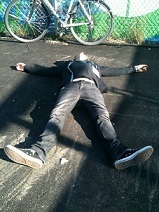 I felt like the king of the world. Beautiful pictures and a stunning beach!! Hi Effie. Yes, it’s amazing. 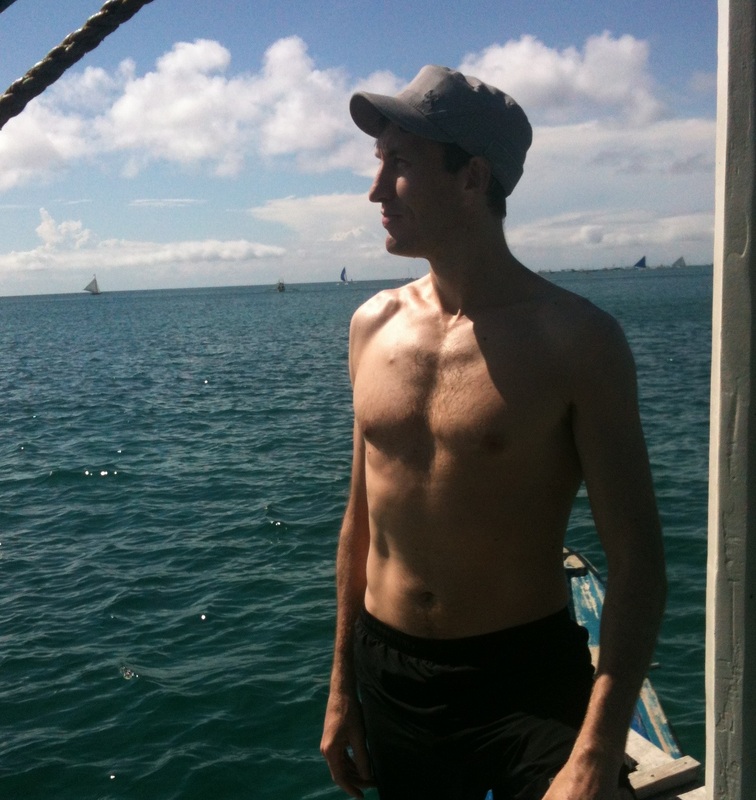 I had no idea that the Philippines is so picturesque. 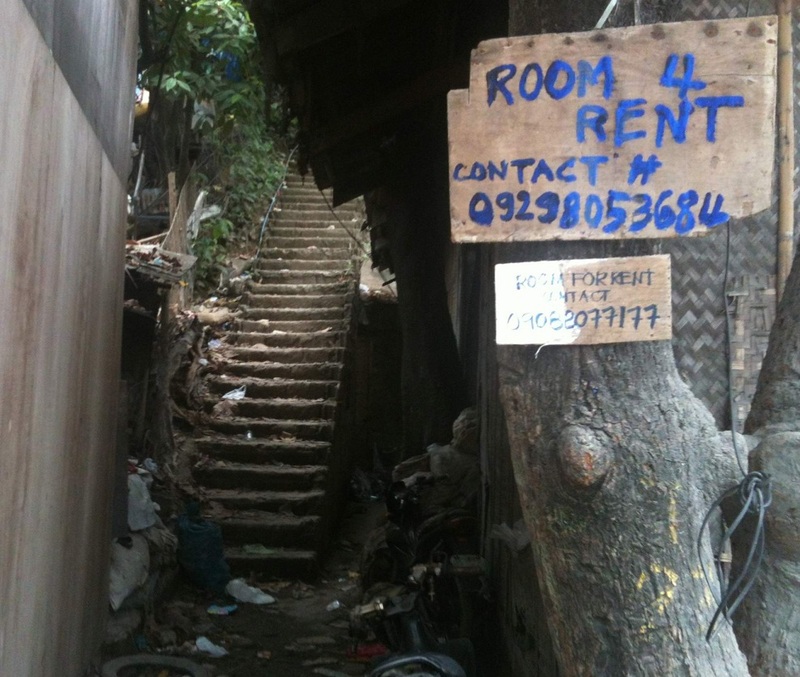 That’s not the image that I had in my mind of the Philippines but visiting the country has completely changed my perspective. 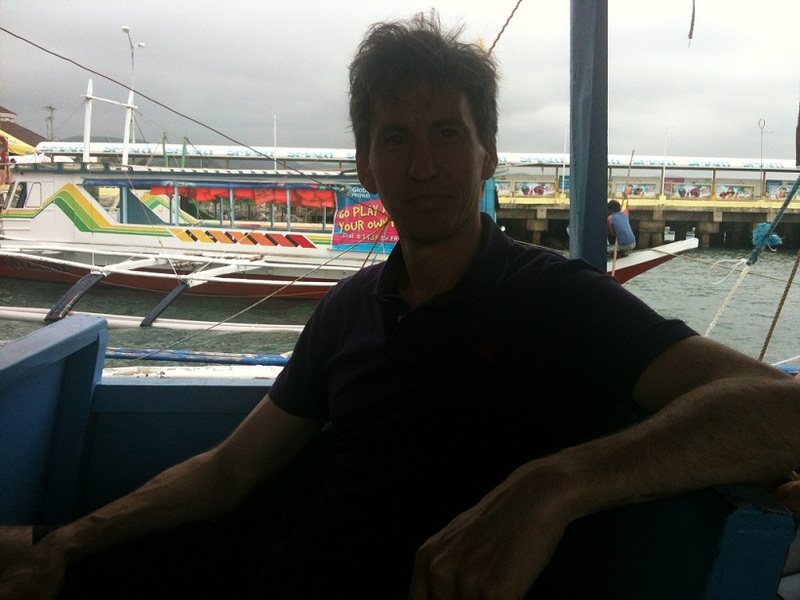 Hey Chris – really enjoying following your adventures on the other side of the world. Looking forward to seeing you next week for drinks! That’s great to hear, thanks Maggie. I’m glad to hear that you’re enjoying the blog. I’m looking forward to catching up with folks next week. Should be fun. Hi Chris, sounds like a little piece of paradise. As in most countries, the most interesting and beautiful places are by and large unknown to the rest of the world. How’s your pidgeon coming along. You be big white fella in PNG with the lino on the floor? 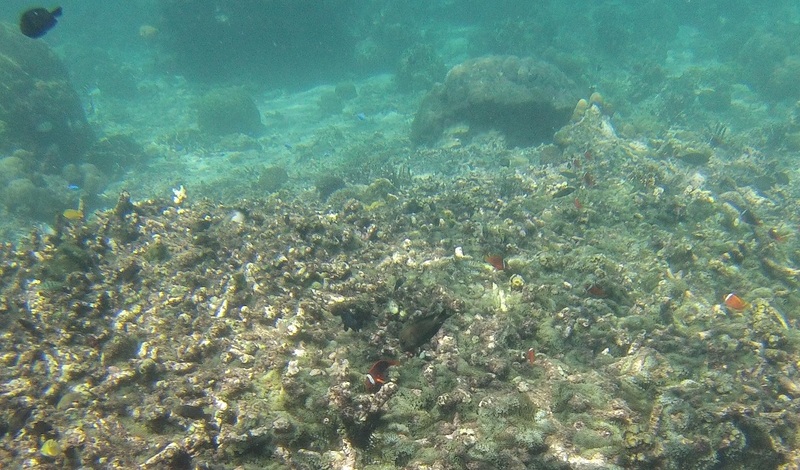 Yes, it’s beautiful and such a nice place to swim and snorkel. I would like to go back some time when I have more time. As for the Pidgin, well I’m not trying too hard to be honest. I will learn enough to get by but that’s all. Most of the people with whom I interact speak English well so it’s not really necessary. I don’t have lino on the floor, but I might see if I can teach some folks basketball (like in Flying High II). Youe humor is spot on and you write how you speak which is relatable and adorable. The bamboo scaffolding, the superfluous Jesus comma and paying for the poor Koreans fare because they’re ubder nuclear threat are a pricless. Its the little things that make the trip, king of the world.